SCEA officially revealed Motorstorm 2, featuring 16 new multi-route tracks, 16 players can race head-to-head online, and 4-player split-screen mode. MotorStorm 2 is moving from the mountainous desert to a lush Pacific island with all of the vehicles familiar to players of the first MotorStorm: ATVs, rally cars, buggies, motorbikes, race trucks, mudpluggers and Big Rigs, but a new monster truck class. The MotorStorm style of anything-goes racing is moving from the mountainous desert to a lush Pacific island, replete with thick swamps, dense jungle, towering peaks and steaming volcanoes. You’ll be rampaging through thick mud, tangled undergrowth, swift flowing rivers, and searing lava pools of this new location with all of the vehicles familiar to players of the first MotorStorm: ATVs, rally cars, buggies, motorbikes, race trucks, mudpluggers and Big Rigs. Joining the cast is the new monster truck class, likely to become a fan favorite. MotorStorm 2 will feature 16 new multi-route tracks, 16 players can race head-to-head online, and 4-player split-screen mode. Exclusively for PS3, MotorStorm 2 is coming this fall. jēj kā es gaidu šo geimu iemet video!!! MotorStorm may have been a brand-new franchise for Sony's PlayStation 3, but developer Evolution managed to make a flat-out success of its simple formula for destruction. In another bold move, the developer has decided to ditch the dusty environment that made the first game so iconic, in favour of a brand-new tropical island setting. 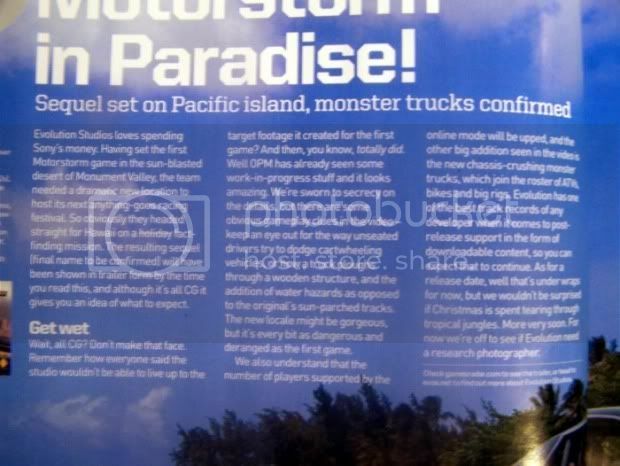 This time, Evolution has taken inspiration from the islands of Hawaii, where volcanoes, waterfalls, and crumbling cliffs will act as all-new hazards for the vehicles, which now include monster trucks. We grabbed the development team at the London PlayStation Day to talk more about the game and to take our first hands-on with it in solo and multiplayer modes. 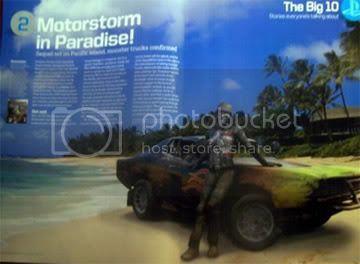 Still early in development, the version of MotorStorm: Pacific Rift that we played was purportedly around 40 percent complete. That means it was a little rough around the edges. But the basic elements of the game were in place, and the proposed third-quarter 2008 release date allows plenty of time for polish. The two tracks we got to play were Beachcomber, which is a single-player level, and Ringod Spires, which is a multiplayer level loosely based on a track from the first game. Both circuits showed off the new environmental additions to the game, such as vines and branches that can take out players on bikes and buggies. Another new addition is water, which can both slow you down and help you cool down your engine. Just like in the first MotorStorm, you can use a boost button to speed up, but if overuse it, your engine will explode. If you take a little dip in the water, though, you can cool your engine down quickly. Although the first game offered online play, many owners complained about the lack of a split-screen mode. This has been addressed in Pacific Rift, and the developers have been almost overzealous by allowing up to four players to share a screen. Of course, there will still be online multiplayer for those who are connected to the Internet, and all of the 16 tracks in the finished product will be playable in multiplayer. Since new tracks were released for the first MotorStorm, there's a good chance the sequel will also be expanded upon, but with 16 in total, that's double the number that shipped with the debut MotorStorm. Also new to the game is the action button, which has been mapped to the square button on the Sixaxis and the DualShock 3. By pressing square and pushing left or right on the analogue stick, you can jerk suddenly to one side and knock an opponent into whatever object lies at the side of the track. This is beneficial if you're in a big vehicle, such as the monster truck we were playing in, and you're attacking a smaller opponent on a bike. However, this move uses up boost, and its sudden jerky movement can cause you to overcompensate when righting yourself on the track. The bikes, ATVs, rear-wheel-drive buggies, rally cars, racing trucks, and mudpluggers will all make a return, and those who want to go on a bike will have a whole new selection of insults to choose from on the triangle button. Developer Evolution has stuck to the proven sound from the original MotorStorm and has included a Pendulum track in the sequel, this time in the form of a track called "Tarantula." However, you can also now create custom soundtracks and import them into the game, allowing for the first time the possibility of smashing opponents off the road while accompanied by a soothing jazz mix. Evolution also promises to emphasise hero and villain characteristics in some of your opponents. Some will be more aggressive and forgo such necessities as helmets and padding. The developers have also incorporated new animations into racing, so you'll see opponents abandoning their vehicles and scrambling across the track or getting visibly frustrated if you knock them off their bikes. It looks as though Evolution has really listened to the fans of the first game when building MotorStorm: Pacific Rift, and it has done well to incorporate split-screen, custom soundtracks, and double the number of tracks for the sequel. We're sure to see more of the game in the run up to the Q3 2008 release, so keep an eye on GameSpot to find out more news as we get it. The most brutal offroad racing festival is back, with players once again descending on the wild and alternative MotorStorm Festival. However, this time the location has changed dramatically, with players attempting to tackle the diversity and unpredictability of a remote Pacific island environment. Developed by Evolution Studios exclusively for PS3, MotorStorm Pacific Rift revisits the intense racing action introduced in last year’s MotorStorm, this time allowing players to navigate a radically different tropical environment chock full of lush jungle, towering peaks, and crystal-clear water. Once again participants in the MotorStorm Festival will throw traditional offroad driving and caution to the wind where the goal is to not only win, but to survive. Players will take on a variety of racing fanatics and battle through chaotic, action-packed tracks in an effort to become the Festival champ. Evolution Studios has once again created the ultimate visceral racing experience, incorporating even smarter and more aggressive artificial intelligence (AI), real-time track deformation, fully destructible vehicles and environments, and stunningly detailed scenery. In addition to the classic MotorStorm gameplay, players will also experience more available tracks and vehicles to choose, as well as extensive multiplayer options including four player split screen and races with up to 20 players online. * Stunning Tropical Environments – racing locations set amongst the lush jungle, emerald lagoons and towering peaks of a remote Pacific island. * Robust Multiplayer Racing Action – For the first time, MotorStorm Pacific Rift offers players the opportunity to challenge friends offline with four player split screen racing. Additionally, players will be able to challenge others online in races of up to 20 vehicles. * Additional Tracks – MotorStorm Pacific Rift introduces 16 diverse, multi-route tracks to challenge even the most seasoned racers. * New Vehicles – As the biggest vehicles available yet, a new monster truck class is available in addition to ATVs, rally cars, buggies, motorbikes, race trucks, mudpluggers, and Big Rigs. * Extensive PLAYSTATION® Network Options – Features include matchmaking, detailed stats and leaderboards, plus plans for comprehensive downloadable content including tracks, vehicles, tickets, game modes, and themes. * Attacking and Offensive Driving – Players must not only try to win the race but survive against the other racers. Combat-like racing takes center stage as the vehicles are the weapons. * Cutting-Edge Artificial Intelligence – A.I. analyzes the race and surroundings and reacts in the most realistic manner possible. Not only will the competition try to win the race at all costs, but the A.I. will react to situations realistically, such as locating the best routes and changing the level of driving aggression based on player actions. * Real-time Track Deformation – Players will never experience the same lap twice as each vehicle will carve up the track in varying depths, making navigation of each lap different than the last. * Physics-Based Car Damage – Players will break and destroy a vehicle’s parts and panels during collisions with other drivers as well as with objects in the environment. Exclusively for PS3, MotorStorm: Pacific Rift is coming November 25, 2008.